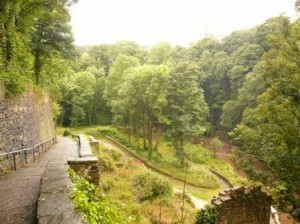 New Mills offers the walker a delightful experience, whatever kind of walk you may be seeking. From short easy walks to day long hikes, or even long distance paths, New Mills has them all. Built above the sandstone gorge known as The Torrs, which forms the confluence of the Rivers Sett and Goyt, development of the town from the original corn mill to the present day can be traced through from the industrial heritage of coal and cotton up to the modern day and the Torrs Hydro Archimedes Screw is one of the earliest community-owned hydro schemes. The influence of the rivers can be seen in the plethora of bridges that span them, from the small footbridges that allowed workers to make their way to their employment to the renowned and stunning Millennium Walkway which completed the Goyt Way and the Midshires Way long distance path. The gorge, the rivers, the canal and the surrounding moors and hills allow the walker to experience varied landscapes, helped along their way by approximately 200 footpaths. More information about the paths, about the history, about the heritage can be found at New Mills Heritage and Information Centre. Access to New Mills is no problem either. With two railway stations complimented by an array of bus services and sited just off the A6, New Mills is nearer than you might think. New Mills is rightly proud of being a member of the Walkers are Welcome Network of towns and villages and looks forward to seeing you soon. The University of the Third Age (U3A) provides lifelong learning for retired and semi-retired people, through its many interest groups, which include educational, creative and leisure activities. 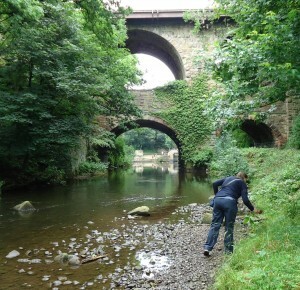 New Mills and District U3A has several walking groups organised by and for our members. These walking groups cover a wide range of walking options from gentle strolls with no stiles or steep hills, through easy walks of 2-4 miles followed by a pub lunch, more demanding walks of 5-7 miles, to long walks of 10-12 miles for our fitter members. Groups meet once a month, with walk locations that vary but they are generally within a fairly local area, although the long walks group travel further afield in the summer months. For more information about New Mills and District U3A see our website (http://newmillsu3a.org.uk). New Mills Natural History Society holds two field meetings in every month of the year, rotating about the days of the week. These can take place locally, but are often in other parts of Derbyshire, or in Cheshire, Staffordshire or Yorkshire. Their objective is to view the flora, fauna, geology and archaeology of the area. The amount of walking involved varies between three and six miles. New Mills & District Ramblers is part of the Ramblers, a national charity working to maintain footpaths, campaign for more access to countryside and encourage people to walk. This friendly group is open to members in the High Peak Borough and from further afield. The group organises a varied programme of walks in the Peak District and surrounding areas with a walk virtually every Sunday and shorter walks on some Wednesdays and Saturdays. They also help to monitor footpaths and support better access to countryside. There is a calendar of social activities, some of which are combined with optional walks. These may include week ends away or outings to areas such as the Lake District, Wales or Yorkshire. Walking for Health is a network of health walk schemes across the country. The Ramblers and Macmillan Cancer Care work together to bring free, short walks to help people get active and stay active. Walking for Health in the High Peak offers a variety of walks, very easy walks up to an hour in duration, easy walks up to 90 minutes and the scheme also supports longer “Beyond walking for health” walks which may take up to 3 hours. Our walks are led by friendly, knowledgeable people, specially trained for the job. For more information on walks in the New Mills area please have a look at our walking programme at www.highpeak.gov.uk/hp/walks-for-health or call 07879 848292 for more details.